In a prime spot facing Government Buildings, Mornington House on Merrion St is a very elegant five-bay Georgian building built by Viscount Monck as part of a development consisting of five townhouses. The house, according to a plaque by the front door, was the birthplace of the Duke of Wellington. The duke’s father, the (1st) Earl of Mornington, is an interesting character. He was a talented musician, and founded the Academy of Music in 1757 with Kane O’Hara. On receiving a Doctorate in Music in 1764 from Trinity College Dublin, he subsequently became the first Professor of Music, a post he held for the next decade. The college is currently celebrating the 250th anniversary of the establishment of this Chair of Music with its “In Tune” exhibition, running until April. Mornington could play any instrument, and he had an amateur band that played at theatrical events held in private houses—a very popular pastime in the eighteenth century. His band included William Brownlow MP on harpsichord and Sackville Hamilton MP on violin. What larks! Many of these theatricals were assisted by students of Whyte’s Academy on Grafton St., and one of the pupils here was Mornington’s son, the future Duke of Wellington. It’s an unusual case of two plaques in the city contributing to the same story. For more on that topic, see Patricia McCarthy’s wonderful essay “Private Theatricals in Irish Houses” in the latest Irish Architectural and Decorative Studies (XVI). 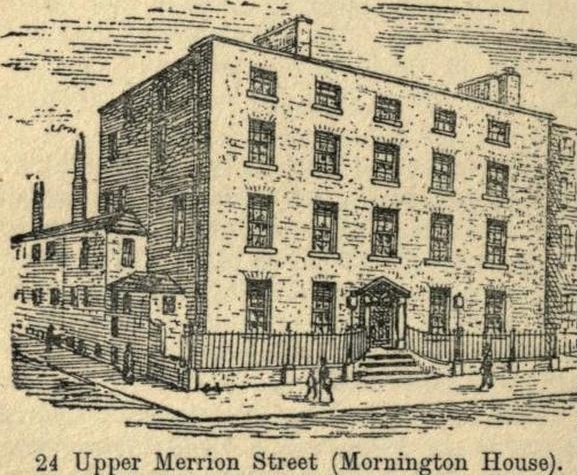 Mornington House is now part of the Merrion Hotel.